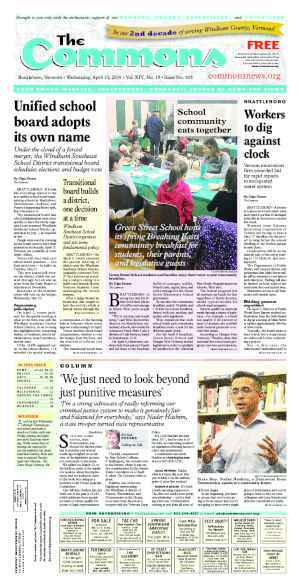 BRATTLEBORO—Less than a month after a Senate hearing in Brattleboro, multiple Windham County groups will receive additional funding, pending legislative approval. 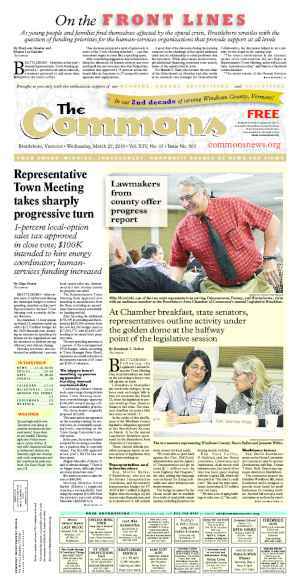 The Senate Committee on Economic Development, Housing, and General Affairs (SEHGA) gathered testimony from local organizations on the health of Windham County’s economy in a special hearing in Brattleboro on March 30 [The Commons, April 11]. Committee Chair Vince Illuzzi, R-Essex/Orleans, and members Peter Galbraith, D-Windham, and Bill Doyle, R-Washington, took about five hours of testimony. Sen. Jeanette White, D-Windham, although not a member of the committee, joined her fellow senators during the hearing. 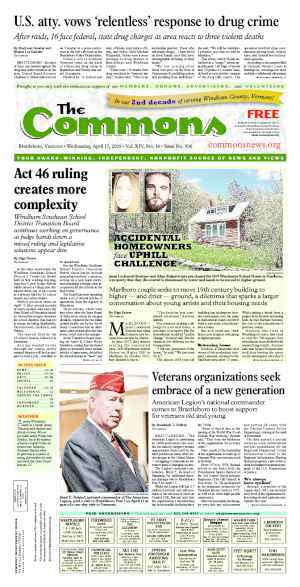 A draft of an amendment to the appropriations bill contains proposed funding for some of the nearly 20 Windham County groups whose representatives spoke at the meeting. The amendment also includes funding for Wilmington and Dover, whose representatives met with Illuzzi and Galbraith later the same day. If approved, these groups could see a combined $393,000 arriving after July 1 when the fiscal year 2013 budget goes into effect. But the draft is still working its way through committee, and the Legislature and Gov. Peter Shumlin have yet to approve the amount. Galbraith said that the key for him was to get funding to Windham County for economic development. 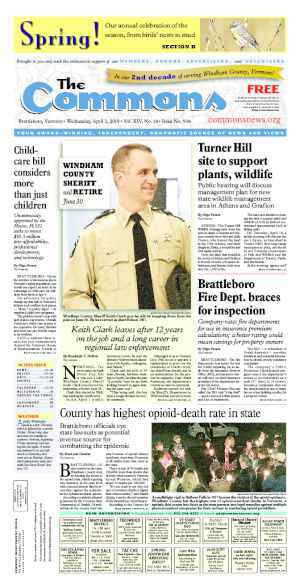 “We got the focus [on Windham County]. How it turns out is still a work in progress,” Galbraith said. Galbraith expects the amendment to be one of the last to reach the floor in the remaining days of this session. The funding would come under the theme of post-Irene, post-Vermont Yankee economic recovery plans for Windham County. A one-time grant to the Vermont Wood Studios in Vernon could also come through. The company hopes to expand its operation on Hogback Mountain in Marlboro. The Wood Studio wants open an experimental furniture showroom at the mountain. The company already has an online presence. The move aims to establish 10 new full-time-equivalent positions as of this year, 34 positions as of 2013, 50 by 2014, and 75 as of 2015. Some green for Green Island? This year’s legislative session could end on a $110,500 high note for the Bellows Falls-based Sustainable Valley Group (SVG). The nonprofit organization, which works to promote a local green economy, presented its Green Island Project at the SEHGA hearing last month. The Green Island Project, located on Bellows Falls Green Island, looks to rehabilitate the island’s former manufacturing space, promote sustainable and green businesses, and provide job training. Green Island, home to the Amtrak railroad station, is considered one of the gateways to the town. After the hearing, the group sent more information to the committee members with costs and other details for the renewable-energy and job-training projects at Green Island, as well as projects of other economic development groups in the Greater Bellows Falls area. SVG would manage the funds, which would come through a variety of sources, including the Vermont Training Program, Vermont Economic Development Authority, and grants. According to SVG member Gary Fox, Bellows Falls has the county’s second highest unemployment. “It’s been a tough few years,” he said. One funding chunk would support a jobs training program for a localvore restaurant at the Amtrak railroad station. Another jobs training program would focus on preparing workers in the green energy and weatherization building sector. The money would fund the technology and techniques of high-performance homes that combine weatherization, renewable energy, and energy-efficiency measures. If the industry is to take off, it will require a work force that understands the technology and the construction of these buildings and knows how to sell them, according to Fox. Trainees normally learn the weatherization and energy efficient construction trade on practice trailers. SVG proposes an initial training program that combines rehabilitating a Green Island building. The group wants to open 30 Island Street to renters. “Why not have the hands-on in the actual building instead?” said Fox. He added that SVG wants the greater Bellows Falls area to adopt a Property Assessed Clean Energy (PACE) district. The PACE program is an opt-in assessment enabling residential property owners to pay for energy improvements through their property taxes. A town must vote to adopt a PACE district, which covers the entire town. Putney and Westminster voters have approved the program. SVG is still educating the community through workshops about PACE but hopes to have enough people interested in the program to vote on it at the 2013 Annual Town Meeting. Under current Vermont law, PACE districts don’t include commercial properties. SVG would like to see that change, and according to Fox, Illuzzi has told the group that he is drafting an amendment to do just that. The amendment will most likely go before the Legislature next session, which begins in January 2013. If the funds are approved, the group will also manage funds for the Downtown Development Alliance for improved signage and information kiosks. Other funds will also go toward marketing a week-long festival honoring local food and the multiple restaurants working with local food situated between Interstate 91 Exits 5 and 6. One of the ventures slated for 30 Island Street, said Fox, is a passive solar furnace start-up company. The devices supplement traditional heating systems like oil-burning furnaces. The large solar panels attach to the south side of a home and can help reduce heating costs by 30 percent. Last year, according to Fox, a Minnesota company won a state RFP for the furnaces, but the cost to ship the panels outweighed the benefits. The cost and resources it took to ship the panels defeated the purpose of reducing carbon emissions, he said, so SVG hopes to support a company to build them locally. SVG, originally formed by a group of Springfield residents in July 2003, hopes to help communities “generate a financially and environmentally sustainable economy,” according to the group’s website. In its early days, SVG held workshops and events on sustainable enterprises and activities. To put ideas into practice, the group took on the Green Island Project in 2011. Originally published in The Commons issue #148 (Wednesday, April 18, 2012).